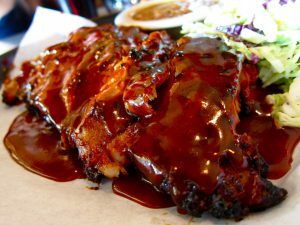 Here’s a good recipe to add on your restaurant menu, the mouth-watering baby back ribs. I’ve put two methods here: The traditional smoking, and the oven smoking method. Both of them produce mouthwatering, fall-off-the-bone ribs. 1. Combine 1/4 cup sugar, chili powder, garlic powder, cayenne, salt, and pepper. Rub meat side of ribs with this mixture and refrigerate for at least 1 hour. 2. Place a 1/4 cup each hickory and applewood chunks in the bottom of a roasting pan. Place a rack in the pan and place ribs on the rack. 3. Combine remaining ingredients in a large saucepan and bring to a boil over high heat until reduced by half. Set aside. 4. Cover roasting pan with aluminum foil and place in the center of a 200 degree F oven and cook 6 hours, brushing with sauce every hour. 5. Take ribs and remove foil. Brush meat side liberally with sauce and place under a preheated broiler until well browned. 6. Slice into 1-rib portions and serve warm with remaining sauce. 1. Repeat 1st step of oven method. 2. Repeat 3rd step of oven method. 3. Place enough hickory and applewood into the firebox of your friendly neighborhood smoker to keep the temperature around 200 degrees F.
4. Place ribs in smoker and repeat last 8 words of step 4. 5. Brush meat side liberally with sauce and place meat side down on a high grill until well browned. Remove and slice into 1 rib portions and serve with remaining sauce.